Esma Redzepova: 'Queen Of The Gypsies' Some singers are one-hit wonders, while others make a few albums before fading away. Then there are those who stay popular for generations. 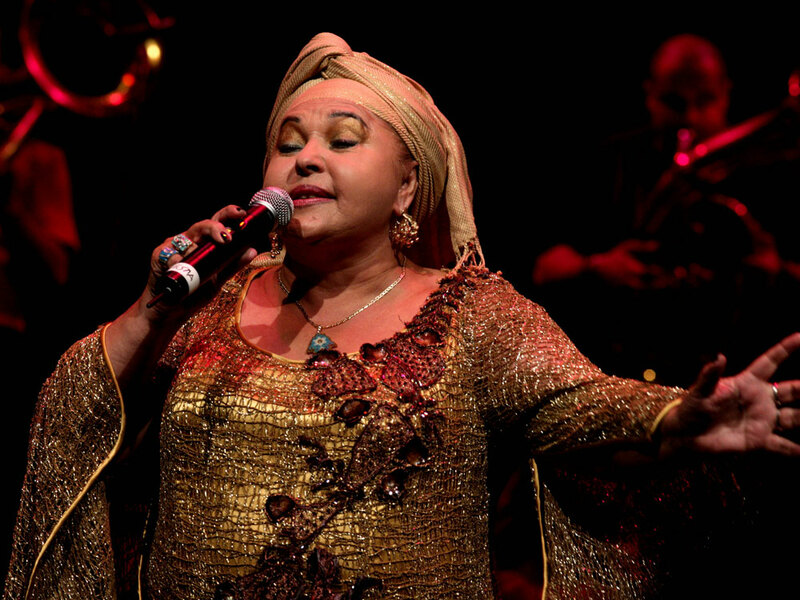 In the former Yugoslavia, one woman has had more hits over more years than just about anyone else: Esma Redzepova, also known as "Queen of the Gypsies." Some singers are one-hit wonders, while others make a few albums before fading away. Then there are those who stay popular for generations. In the former Yugoslavia, one woman has had more hits over more years than just about anyone else: Esma Redzepova, also known as "Queen of the Gypsies." Millions around the world have heard Redzepova's "Chaje Shukarije," which was featured in the opening credits of the movie Borat. "Chaje Shukarije," or "Beautiful Girl," is an anthem in the former Yugoslavia. People there have been dancing to it — and singing it — for years. Gago Ivanovski and Ognan Chalovski are university students in Skopje, the capital of Macedonia, where Redzepova was born. Chalovski says everyone there is a fan of Redzepova: "She knows how to make a good atmosphere, and she is very happy." For more than 50 years, Redzepova has flourished as a performer and recording artist, despite political upheaval and prejudice against Gypsies — or Roma, to use the more acceptable term. In whoops, warbles and whispers, she sings about Roma culture, life's disappointments and especially unrequited love. In "Chaje Shukarije," she sings, "Beautiful girl, don't go in front of me, turn to me, see me, and when you'll see me try to love me." Sitting at her kitchen table in Skopje, Redzepova is wearing gold earrings and a tasseled black scarf over her hair. Her eyes twinkle when she talks. Though she plays the diva, she admits that she'd probably never have become a star but for a lucky break: When she was 14, her school principal signed her up for a singing competition on the radio. To her astonishment, she won. The award for the competition was 11 million Yugoslav dinars — at that time, four to five months' salary. But this was a problem. Redzepova hadn't told her family about the contest, because she knew her father wouldn't approve. So she hid the prize money in her underwear. Her mother was preparing a bath for the kids a few days later when her daughter's secret slipped out. "She exploded at once," Redzepova says. "And when my father came home, she explained to him and he was a little angry. I promised to him that if I became a singer, I would only be a radio singer — I'd never play in restaurants or bars or something like that." That was a consequential choice. In Yugoslavia in the 1950s, singing at weddings or in bars was pretty much the only career option for Roma musicians. Redzepova forged a new path, thanks to an enterprising young producer named Stevo Teodosievski. He had heard her perform on the radio one night. University of Oregon music anthropologist Carol Silverman says it was the genesis of a great partnership. "Her visceral talent was immediately obvious to Stevo, but he was a visionary, too," Silverman says. "I think he had vision of taking Romany culture to a larger stage. Stevo groomed Esma for radio and television, even picking her costumes. This young woman from the Roma ghetto became one of the first Yugoslav stars of the TV age, and a favorite of the country's dictator, Marshal Tito." At first, Redzepova says, she wasn't ready for the vocal virtuosity Teodosievski demanded. For example, when she composed "The Little Gypsy Girl," he was not satisfied with her original performance. He sent her back to the studio to practice. After two years of practicing "The Little Gypsy Girl" for up to four hours per day, five days a week, she finally produced a take that satisfied him. A relationship requiring that much commitment could only result in marriage. The two were wed in 1968. In the decades that followed, they toured the world together. Unable to have children of their own, they became foster parents who took in 47 boys in all, throughout the '60s,' 70s and '80s. Now grown men, they often play gigs with their foster mother. Twelve years ago, Teodosievski died. Someday, Redzepova says, she'll turn her home into a museum of the music she and her husband made together. "There is a special part in this museum which will be a memorial," she says. "His accordion, my mike, it will be in one place." She's had to put off that dream for a bit. At 64, Redzepova still plays scores of dates every year, all around the world. Her secret to keeping those vocal cords strong? She says she avoids fizzy drinks and romantic relationships with men.